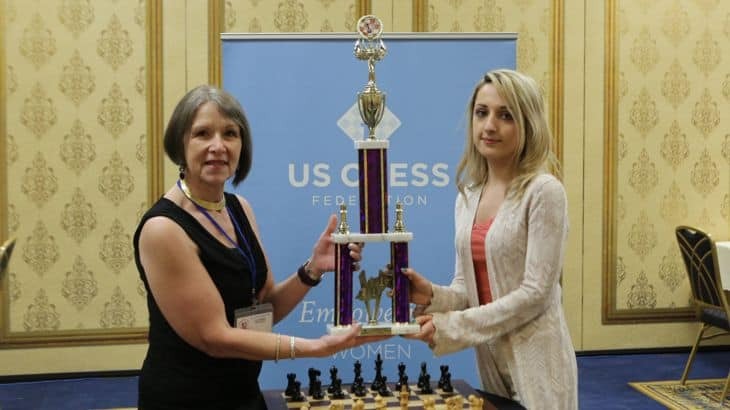 The June US Chess Rating Supplement will be used for pairings and prizes. Other ratings may used at the TD’s discretion as described on the National Open page. The U.S. Women’s Open draws women and girls from all over the world. A great tournament played in a friendly atmosphere. Entry Fee: $99 by April 30, $120 later. Players may register later with round 1 bye. Meet & Greet: 9:30 a.m.
Tuesday 10 a.m., 2:30 p.m. & 7 p.m.
Wednesday 10 a.m. & 2:30 p.m.
1/2 point bye available in any round (limit 2) if requested in advance. Membership in the U.S. Chess Federation is required of all players except foreign GMs, IMs, WGMs or WIMs. You may join with your entry or on site. Players will not be allowed to complete the tournament without a valid membership.